This article is about the American automobile. For other uses, see Peerless (disambiguation). The Peerless Motor Car Company was an American automobile manufacturer that produced the Peerless brand of motorcars in Cleveland, Ohio, from 1900 to 1931. One of the "Three Ps" – Packard, Peerless, and Pierce-Arrow – the company was known for building high-quality luxury automobiles. Peerless popularized a number of vehicle innovations that later became standard equipment, including drum brakes and the first enclosed-body production cars. Established in Cleveland in 1900 at 43 Lisbon Street, Peerless Motors began producing De Dion-Bouton "machines" under license from the French Company. Engineer Louis P. Mooers designed the first Peerless models, as well as several proprietary engines. The first Peerless-branded vehicles appeared in 1902, with a front-mounted engine driving the rear wheels through a shaft. This later became the standard vehicle propulsion layout for automobiles. In 1904, Mooers designed the Green Dragon racecar and enlisted Barney Oldfield to drive it. The Green Dragon brought notability and success to Peerless, as Oldfield used it to set a number of early world automobile speed records. In 1905, the 35-horsepower Green Dragon competed in the world's first 24-hour endurance race in Columbus, Ohio. Piloted by Earnest Bollinger, Aurther Feasel, and briefly by Barney Oldfield, the Peerless led the race for the first hour before crashing into a fence, later finishing in 3rd place. From 1905-1907, Peerless experienced a rapid expansion in size and production volume. As the Peerless namesake grew in fame, the company began producing increasingly higher-priced models with a focus on luxury. In 1911, Peerless was one of the first car companies to introduce electric lighting on their vehicles, with electric starters added in 1913. In 1915, the firm introduced its first V8 engine, intending to compete with the Cadillac V8 introduced a year earlier. This model became Peerless' staple production vehicle until 1925, when engines produced by other manufacturers were first used in Peerless models. During World War I, Peerless manufactured military vehicle chassis and trucks. One such vehicle, Peerless Armoured Car, was manufactured for Great Britain with the Austin Motor Company of Birmingham being the maker of the armored body and Peerless the manufacture of the chassis. The chassis was manufactured in Cleveland, Ohio. In 1929, the entire Peerless range was redesigned to compete with other vehicles produced by Stutz and Marmon. This move saw increased sales, and for 1930 another design refresh was undertaken. The Peerless-designed V8 was replaced by a Continental straight-8 as a cost-saving measure. However, the Great Depression that began in 1929 greatly reduced the sales of luxury automobiles. Peerless stripped down production and attempted to market one line of vehicles to wealthy Americans who were not affected by the depression. In 1930-31, Peerless commissioned Murphy Body Works to design what the company envisioned as its 1933 model. The task was assigned to a young Frank Hershey, who produced a remarkably clean, elegant vehicle. A single V16-engined 1931 Peerless was finished in June 1931, the last Peerless ever produced. Peerless remained an idle business until the end of Prohibition in 1933 allowed the manufacture of alcohol. Peerless then revamped its factory and gained a license to brew beer under the Carling Black Label and Red Cap ale brands. Hershey's single prototype remained in the Peerless factory until the end of World War II and it is now owned by the Crawford Auto-Aviation Museum. The following Peerless vehicles are deemed "classic cars" by the Classic Car Club of America (CCCA): 1925 Series 67; 1926 — 1928 Series 69; 1929 Model Eight-125; 1930-1 Custom 8 and the 1932 Deluxe Custom 8. However, all Peerless vehicles are considered collectible. ^ a b c d e f Vaughn, Daniel. "1912 Peerless Model 36". ConceptCarz. Retrieved 18 December 2014. ^ a b c d e f g h i Georgano, G. N., ed. (1971). Encyclopedia of American Automobiles (2nd ed.). London: Rainbird Reference Books. pp. 153–154. ISBN 0-525-097929. ^ Estep, E. Ralph, ed. (6 September 1905). "Eventful 24 Hours". The Motor Way. Chicago, IL. 13 (1): 13. Retrieved 14 August 2010. Wikimedia Commons has media related to Peerless Motor Company. 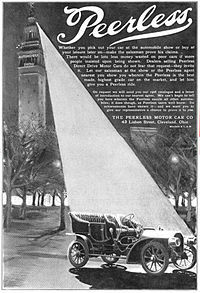 The Frederic W. Goudy Collection at the Library of Congress contains illustrated advertising posters for the Peerless Motor Company. Tank Chats #26 Peerless Armoured Car Tank Chats #26 Peerless Armoured Car. This page was last edited on 10 March 2019, at 18:48 (UTC).